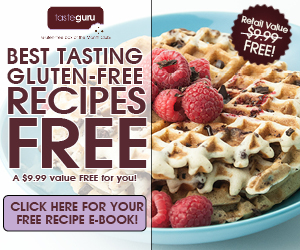 FREE Gluten Free Recipe Book! Home / Freebies / Free Stuff Online / FREE Gluten Free Recipe Book! I have an awesome FREE Gluten Free Recipe Book for you today! Right now you can grab this e-book recipe book for completely FREE! If you have a Gluten Free Family and you’re looking for some awesome new recipes, be sure to check out this awesome Gluten Free Recipe Book. This e-book recipe books is regularly priced at $9.99, but today you can grab it for completely FREE which is so great. Don’t miss out on this awesome FREEBIE today, grab your FREE Gluten Free Recipe Book while it’s still available! Panera Freebies | FREE Coupons, Coffee, Tea, & Pastries!